How Would You Grade Our Schools? How do you feel about the schools in your community? How would you grade the nation’s schools? How many of you would award your child’s school an A, B, or perhaps an F? The Gallup organization has been polling Americans about their views of education for 45 years. The results are published annually by Phi Delta Kappa International. You might be surprised by the findings and the trends observed through the years since the first polls were conducted. Before I go any further, let me remind us all that the published survey results represent the opinions of people in the sample population surveyed, and these opinions have very little to do with reality. Just because a carefully selected sample of people thinks their schools are fantastic or rotten does not mean their schools are fantastic or rotten. It only means that is what they report to pollsters. In truth, most people have very little actual knowledge of the quality of the schools in their communities. As for the effectiveness of our nation’s schools, we only know what we surmise from anecdotes we hear from friends, family, and people we know in our communities. We also draw opinions from media reports that are often derived from press releases published by various organization, governmental and non-governmental. These organizations almost always have an opinion driven agenda. Some people may experience several schools in different parts of the country as they or family members move, but there are more than 133,000 schools in the United States. Each school is a reflection of the community it serves and the state in which it operates. Each of these schools has a unique group of teachers educating a unique and diverse population of students. The students change every year and so do many of the teachers. According to the National Center for Educational Statistics, 88 percent of the students in our country attend public schools, another 9 percent go to private schools, and the remainder, about 3 percent, are home schooled. According to the United States Census Bureau, the number of high school graduates among adults is at an all-time high. In only one century, the percentage of high school graduates in the adult population grew from around 10 percent to nearly 90 percent. The number of college graduates with at least a bachelor’s degree is also at an all-time high of approximately 30 percent. The average salary of those with at least a bachelor’s degrees is more than twice as high as those with only a high school diploma. Many highly skilled workers also enjoy high wages as a result of education and training not requiring a bachelor’s degree. In many states, the average salaries of those with associate degrees or technical certificates may be higher than those with only a bachelor’s degree, but both are significantly higher than those who went no further than high school. The unemployment rates for those with only a high school diploma are more than twice as high as those with college or technical degrees and certificates. The unemployment rate for individuals without high school diplomas is five times higher than those with a college or technical education. It pays to pursue education beyond high school in the United States. By the time a person reaches the age of 18 and completes high school, he or she will have directly experienced at least 30 different teachers, coaches, club advisors, band directors, and counselors. An eighteen year-old would have spent more than 70 percent of their years attending school, or about 14,000 hours, more if they attended pre-school. On the other hand, high school graduates will have spent only about 11 percent of their lives in school. School is key to a person’s future, but other influences may be far more significant. What exerts the greatest influence on a child’s development depends upon the family, the community environment, peer pressure, and other socio-economic factors far beyond the control of schools and their teachers. In the United States, there are world-class schools that out-perform schools anywhere in the world. Unfortunately, there are horrible schools as well with incompetent teachers and administrators, overseen by dysfunctional and even dangerous school boards. We have a tendency to describe schools and their effectiveness by averages, and therefore, we overlook the extremes of excellence and failure that exist. News reports tend to focus on the negatively sensational and that is often how we form our opinions. The results of the Gallup Poll illustrate this very well. According to the most recent survey conducted by Gallup in 2013, about 53 percent of Americans would give the schools in their local communities a grade of A or B. This is the highest percentage ever reported in the forty years that this question has been asked. And the trend is up. Now more than ever before, people give their local schools high marks. At the same time, only 4 percent say the schools in their local communities deserve an F. And this percentage is declining. The above trend represents the opinions of everyone in the sample, whether they have children in the local schools or not. 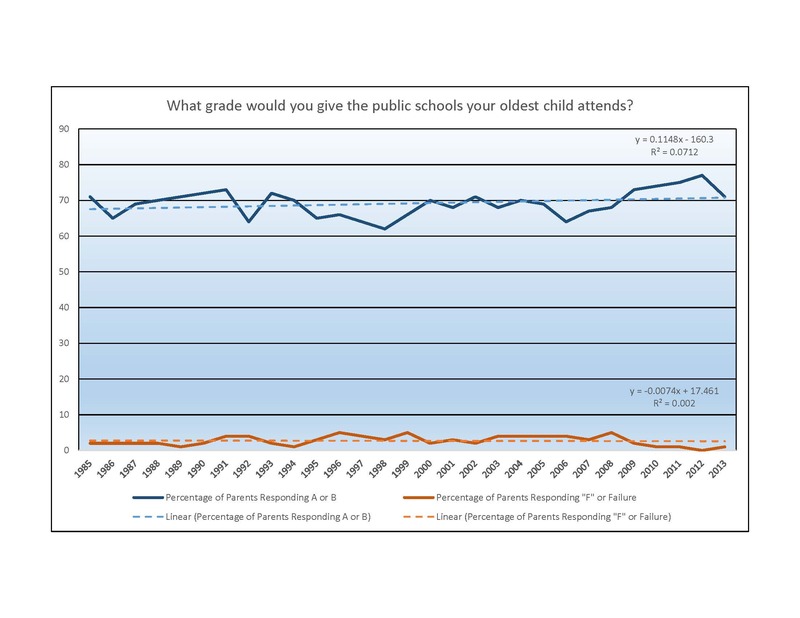 The Gallup survey also asked parents the same question and the results are even more favorable. This year 71 percent of respondents who were parents rated their oldest child’s schools as deserving an A or a B and only 1 percent gave their own schools an F. For some reason, last year fully 77 percent of parents gave their child’s schools an A or B grade, and amazingly, zero percent assigned an F to their own child’s school. 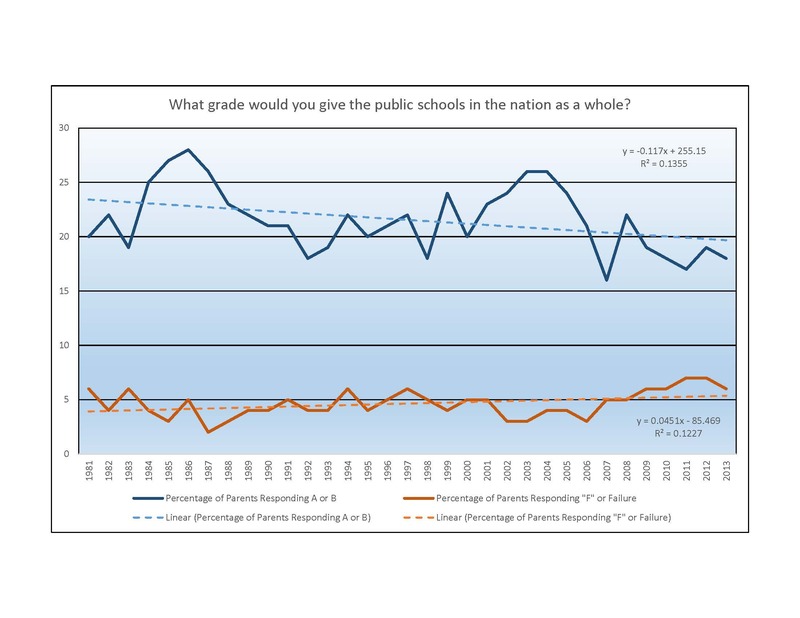 In stark contrast, in the opinion of those surveyed, the grades deserved by the nation’s schools are not nearly so high, and the trend is definitely downward. Only 18 percent assign a grade of A or B, while 6 percent report that the nation’s schools are failing. Most Americans rate the nation’s schools as deserving C or D grades. This is not good news. These results are paradoxical. The majority of Americans sampled consider their own schools to be good or excellent, but they do not consider the nation’s schools so favorably. What is the truth? The truth is hard to measure, and we are not measuring it in any scientific way. Politicians have discovered that the alleged failure of our schools is another one of the those perpetual problems just waiting for them to solve. To be sure, any institution such as our educational system can be improved. And those involved, teachers, parents, school administrators, and our political leaders should endeavor to continuously pursue excellence. Measuring effectiveness is necessary to monitor progress. Political interventions are all too often not helpful, and perpetual problems don’t go away. Local school boards should have the greatest responsibility for improving the effectiveness of their schools. They are closest to the people they represent and can be held accountable when schools are not progressing. Furthermore, with local control comes the possibility for innovation and experimentation. Each school is a laboratory for understanding how to improve our schools. States should ensure that funding is sufficient and equalized. Every student in the state should have an equal opportunity for an excellent education. The national government should have little responsibility for public education beyond funding special programs and initiatives not possible for the states or local communities to support on their own. This entry was posted in Education, Media, Politics and tagged Education, Gallup, Media Bias, Perpetual problem, Schools. Bookmark the permalink.